Project Sunroof has checked the viability of 60 million US rooftops. A five kilowatt rooftop solar installation now costs just $12,500 on average after tax credits, and pretty soon, installing one might soon be a matter of re-tiling your roof. Whether it's right for you, however, depends in large part on how much sun your house gets. That's where Google's Project Sunroof comes in -- launched just two years ago, it has now surveyed over 60 million US buildings in 50 states. That means there's a good chance you can see the electricity production potential in your city, neighborhood and even specific house. Google calculates the amount of sunlight on your roof based on "3D modeling of your roof and nearby trees," weather patterns, the position of the sun in the sky during the year and shade from buildings, trees and other obstructions. 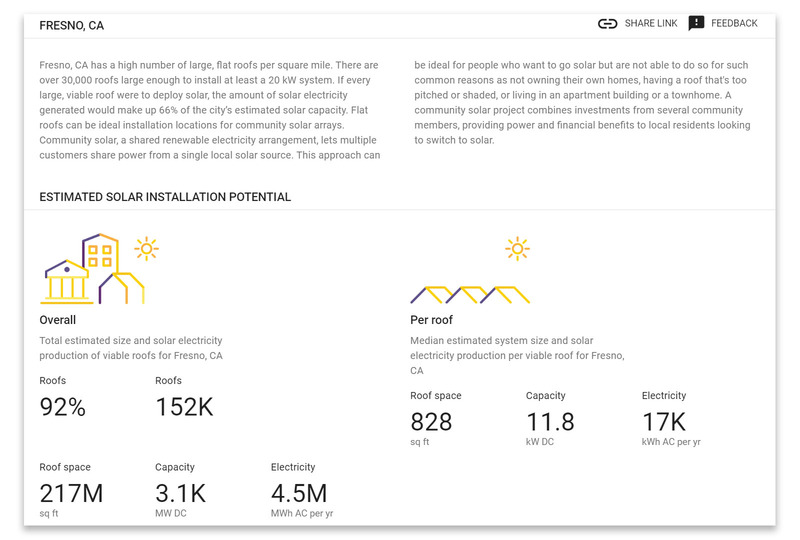 That info is then converted to energy production "using industry standard models for solar installation performance," Google says. The results are surprising: 79 percent of all US rooftops are solar viable, meaning they have enough unshaded area for solar panels. Obviously, some regions are better than others -- over 90 percent of homes in Hawaii, Arizona, Nevada and New Mexico are technically viable, but even northern states like Pennsylvania, Maine and Minnesota are over 60 percent. Houston, Texas has the most solar potential of any US city, with 18.9 gigawatt-hours of total power generation capability if all roofs had solar panels. Project Sunroof can give you a lot of city-wide information (above), including the percentage of buildings (both commercial and residential) that are solar-viable, the total electrical generating capacity, average roof space and the total CO2 reduction viability -- in tons, cars taken off the road and seedlings planted. There's a good chance you can find your own house by drilling down more. I found three at random on Google Maps in San Francisco, Kirkland and Albuquerque, and Project Sunroof had mapped them all. (I live in France and Project Sunroof only works in the USA.) For the Albuquerque home, it showed 2,011 hours of usable sunlight per year and 1,427 square feet of roof space. 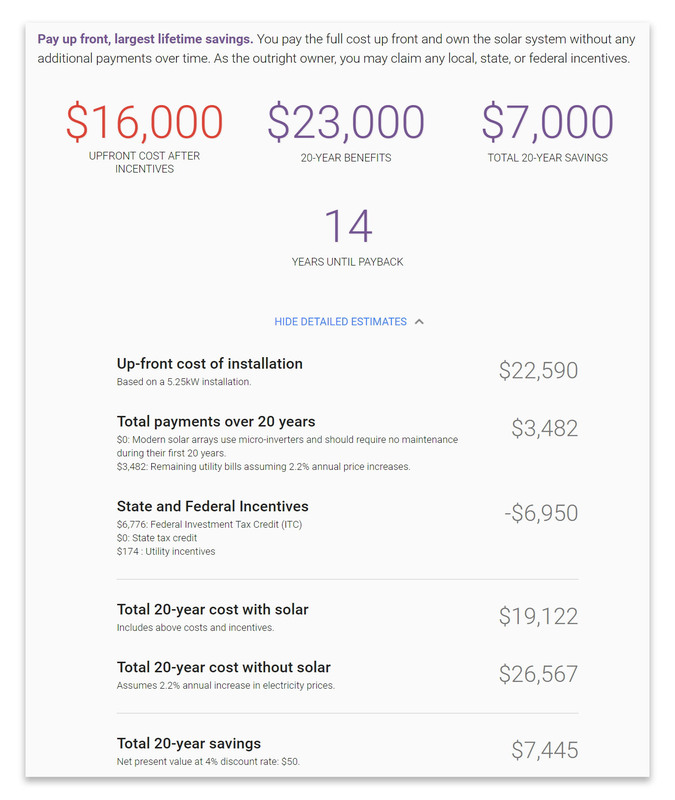 Google figures that solar panels will reduce the home's electric bill if it's more than $175 per month, and recommends a 5.25 kW installation (370 square feet) to cover about 97 percent of its electricity usage. You can see your upfront costs, 20-year benefits, total 20-year savings and years until payback. The calculator can even drill down to a detailed estimate, as shown in the example below. Google is figuring this out based on just a satellite photo, of course, so an estimate from an actual installer will likely be different. However, it's a fabulous tool to get an eyeball idea as to whether solar is really right for you.